“Reverse please”, I am directing the captain of the Vertigo II to back the boat down and help me recover a deep diving trolling lure that is hung in the bottom. At the moment I am lamenting the fact that despite my objections, Pete Santini (our guide) had me put a 130lb wind-on leader on the 50lb class braided line trolling outfit. I had suggested an 80lb leader just in case this happened. He suggested that they sometimes hook big marlin while trolling for tuna and Wahoo in the Galapagos. I was skeptical (more on that later). Now I am now faced with the nearly impossible task of breaking the lure free or snapping the line. Damn you Santini! The wind-on leader consisted of a 12ft length the new Yo-Zuri TopKnot 130lb Flurocarbon leader threaded into a 5ft length of hollow 200lb Spectra. The main line (braided) has a short bimini-twist that has been passed through a loop in the 200lb Spectra. The same connections that ensure maximum strength also make the rig very difficult to break off if it gets hung up. The boat has finally slipped well past the point of the bottom where the lure is hung up. Now I have to try to get it free. A dozen or so sharp tugs suggests the Galapagos Islands bottom structure is not going to give in easily. I point the rod at the bottom (to avoid damaging it), push the drag to the maximum, but the lure remains stuck. I am now down to the “nuclear” option. I slack off the drag and wrap a few turns of line around the reel and lock it up again. As the line gets really tight I tug it sharply and it finally breaks free. When the line finally mades it all back into the reel, I examined the break. The entire wind-on was intact and the 90lb snap (used to connect the lure) has been pulled nearly straight. This was NOT the expected outcome. The weak point should always be the knot that attaches to the lure/snap or the main-line itself. However, it is really hard to break the main-line. Whatever, the line rating is, it will certainly break even higher than that. Add a short bimini twist (which acts as a spring), and the connection to the wind-on is at maximum strength and the springiness of the bimini absorbs any sharp tugs. The very last knot really should be the failure point. In this case, the snap was simply too light. Either way, this is valuable lesson when building any rigs for extreme fishing. When Santini and I debated the correct wind-on, my concern was that a 130lb TopKnot leader was overkill. 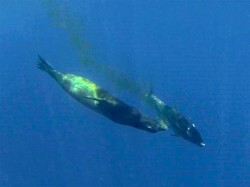 An 80lb leader would be strong enough the handle the wiring of wahoo and yellowfin tuna (up to 100lbs). By “wiring”, I mean that act of putting your hands on the leader to get the fish in position for a photo, release, or a gaff shot. I also thought the odds of hooking a big marlin were pretty slim. 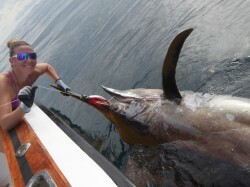 Though there are plenty of marlin (all big) in the Galapagos, the big ones rarely hit a trolled deep-diver. The decision never considered the toothy wahoo, because when those are targeted we add a 90lb wire leader. It was really about the ability to wire the fish. A day or so later, I am still reminding Santini about the 130lb wind-ons that were still in place after the early problem breaking one of them free. It had been a really good day that included several big grouper, a bunch of 75lb class yellowfin tuna on poppers, and we were back to trolling for big wahoo. We also added a short length of wire in front of the lure to prevent bite-offs. I had boated one that was well over 60lbs and it was Tarin’s (my wife) turn on the rod. 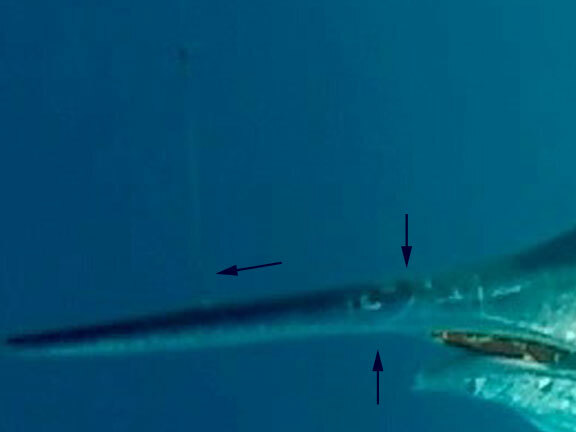 The starboard rod gets hit and it initially looks like a small wahoo or maybe a tuna. 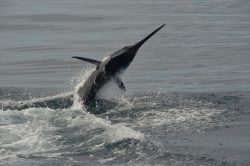 As she lifts the rod from the gunwale, the line starts to explode off the reel, and then a 450lb black marlin starts jumping. Pete Santini skewers me with an “I told you so!”. I am speechless and looking for a place to hide. Tarin is no rookie. She once caught/released a 650lb+ black marlin (video here) on a stand-up 80lb out in under an hour. 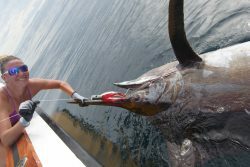 She also caught/released a 450lb+ black on a two-speed 30 loaded with 50lb in less than 30 minutes. 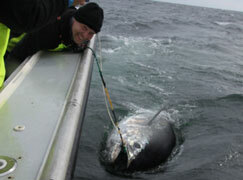 She has also managed a 700lb+ giant bluefin tuna (video here)on stand-up this past summer in just over an hour. It may seem like I am bragging, but she has certainly caught some notable fish on stand-up. We have the right angler on the rod, and we also have a couple of other things going for us. The 130lb TopKnot Fluorocarbon wind-on will be critical if we ever get to wire the fish. The reel is loaded with 50lb braid and we know that connections are sound. Tarin can apply a lot of pressure. We do have one great fear. The hooks in the deep-diver are 3/0 size and it doesn’t take much to bend them straight. Most likely those hooks are going to either be straightened or simply pull out before we ever get the fish anywhere near the boat. Tarin makes the decision to apply nearly maximum pressure to shorten the fight and ensure the best chance of a successful revival and release. Sometimes you just need to put the fish first. Maybe it would have been different if it was her first marlin. As we watch her adding drag with her gloved hand and not giving the fish an inch, we give her almost no chance of getting the fish to the boat. However, as the minutes go by, I am starting to think that maybe the hooks are in the right place. A half-hour later I see color and have the fish centered in the underwater camera. Tarin never gives the fish a chance to turn its head, and leads the fish perfectly to the wireman who quickly brings the fish to the side of the boat. Then the “fun” begins. The fish is so green that it proceeds to beat the crap out of Santini (who has grabbed the bill) and Luis (the wireman/mate) who is trying to get the lure free. The lure slips free and the fish is released (escapes) in record time. Pete and Luis are comparing bruises and scrapes. It was amazing that neither of them were speared by the bill. 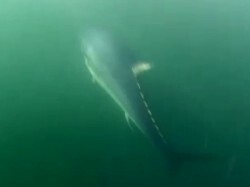 When we finally got a chance to review the underwater footage, we discover why the fish did not throw the lure. If you look carefully you can see the entire lure in the fish’s mouth, but more importantly the leader is wrapped one time around the bill. This meant that most, if not all, of the pressure applied by Tarin was distributed to the bill and not the lure. The 130lb wind-on certainly made the difference at the end of the fight. One more amazing story (with plenty of proof) from the Galapagos Islands!